You are here: Home / News / 2018-2019 HAWKS TICKETS!! 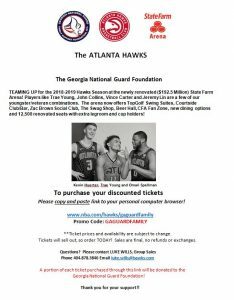 The Atlanta HawkHAWKS Discounted Tickets 2018-2019 Season updates just updated our links and promo code to purchase discounted HAWKS tickets for the 2018-2019 Season at the new and improved State Farm Arena! A portion of the proceeds from each ticket purchased through our link will be donated to the GA National Guard Foundation! Thanks to all for your interest and support! GO HAWKS!